France in London | Rachida Dati: Wonder woman or traitor woman? Rachida Dati: Wonder woman or traitor woman? Not so long ago, upon announcing her controversial pregnancy, Rachida Dati promised she would be able to reconcile motherhood with her political functions… and so she did! She kept on going to work with her enormous belly and, now that Zohra is born, she has taken a meer 5 days off before taking a political high-case on. And all this she does with high heels and a relaxed expression. Even more shockingly, less than 24 hours after delivering her baby, she was already following her dossiers at the hospital (bear in mind she had also had to undergo a C-section.) Infuriatingly for many, she still manages to look in better shape than most of her colleagues (see Roseline Bachelot, left of picture)! I have to say that, as the kind of person who takes a week off at the first signs of a cold, she has my sincere admiration… I guess not everyone can be a Wonderwoman! And yet , for many this express maternity leave is the hight of controversy. Rachida Dati always breaks new grounds and strongly divides opinions. After an unusual career, she found herself in a, let’s say, unseen and uncomfortable situation: A high ranking minister, pregnant, unwed and on top of this, she stubbornly refused to name the father. Annoying isn’t it? And though, the French Minister was absolutely radiant, happier than ever and absolutely not embarrassed: Rachida Dati shattered the image of single motherhood. « Having a child is fundamental for me and it will be the best day of my life. » Debates explodes and she just keeps on smiling. Rachida Dati is the symbol of all women with high responsibilities who want to enjoy both their career and life as a mother. And so it is she finds herself under the spotlights: How could such an important woman deal with her pregnancy? Is giving birth really possible at her level of responsibility? How will she handle it? Rachida Dati opted for work. She claimed she was not ill and could carry on working despite the fact that her belly was becoming larger and larger and could go back to work before anyone noticed. Five days and she checked out of the hospital and came to the traditionnal “Conseil des Ministres” (weekly meeting between the French ministers and the President) on foot, like everyone else. During the afternoon she had other appointments, which she had absolutely no intention of cancelling. As journalists asked her about her shape, she answered, as if nothing had happened that she was great. So can she be a young mother, minister and mayor at the same time? Is she a model to look up to or is she simply doing too much? 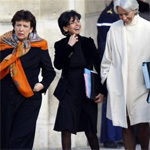 As a comparison, three French women ministers have had children whilst in office, including Ségolène Royal, but none was back to work so quickly. Is this serious? Is this a good thing? Should we be inspired by her behaviour? Some women blame her because, by acting in such a way, she denies women’s hard faught for right to maternity leave. True, maternity leave has been an immense step for feminism: under French law, Rachida Dati could have been entitled to whole 16 weeks! She took just five days. Is she debunking this precious right? Maybe, but, on the other hand, she proved that discrimination toward women because of an eventual future pregnancy is absolutely not justified. So, Rachida, feminisitic icon or women's enemy? I'll let you judge and this is not going to be easy, because as far as I’m concerned, the only judgment I can express is that her behaviour may be too extreme. First regarding her own health. Granted, I have been called a hypochondriac, but my point is, a woman needs rest after delivering a baby. It becomes especially important in Rachida Dati’s case since her labour had been complicated and she eventually had to undergo a Caesarean. This is a major surgical operation! Therefore it has to be taken seriously. I know some women who have had C-sections and they are all agreed: it hurts so much that you can't do anything during weeks. Just to give you an idea, in the UK a woman who has undergone a C-section mustn't drive for three weeks proceding the operation. Not to mention the tearing-risk... So, even if Rachida Dati seems to be perfectly fine, I think her behaviour is too risky to be considered as an example. Then, regarding the child’s well-being. I don’t mean to say that women have to stay at home to take care of their children, but, it has been proven that a baby needs contact with its mother during the first moments of its life. Five days just seem a little too short to me. Don't you think? Moreover, another question is still nagging me: did Rachida Dati really have a choice? I mean, could a Minister be absent for more than a week? This is particularly relevant since Nicolas Sarkozy just announced a deep reform of the judiciary system. In this case could the Justice Minister stay at home changing nappies? 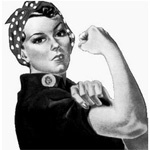 So… icon for feminism, traitor of women’s rights or just a working woman under pressure? Rachida Dati definitely remains a mystery to me. makes our frumpy lady MP's look second rate . She is ambitious and political and i am sure a powerful force to contend with . does anyone know where she gets her hair cut !!?? ?